Since the beginning of the year the Port of Hamburg has offered an optimized service portfolio for handling ultra-heavy loads. With a unit load capacity of 600 tons, ‘Enak’ is the most powerful salvage/floating crane in Germany. This heavyweight was formerly stationed in Bremerhaven. The new owner Lührs Schifffahrt, who acquired 'Enak' from Bugsier Reederei, has transferred the floating crane to Hamburg. As a universal port, Hamburg offers a wide range of waterside cargo handling services. Along with containers and bulk cargoes, these naturally also cover conventional general cargoes. With a volume of 1.4 million tons, these may constitute no more than 1.5 percent of total throughput, but their depth of added value and impact on jobs make them an important element in the Port of Hamburg’s cargo mix. Several specialist multi-purpose handling facilities, including Wallmann & Co., C. Steinweg (Süd-West Terminal), Rhenus Midgard and Unikai Lagerei- und Speditionsgesellschaft are well equipped to handle project shipments, heavy and out-of-gauge cargoes. Ultra-heavy general cargoes are usually handled with the aid of ship’s own lifting gear or quayside crane capacities to a maximum of 400 tons. 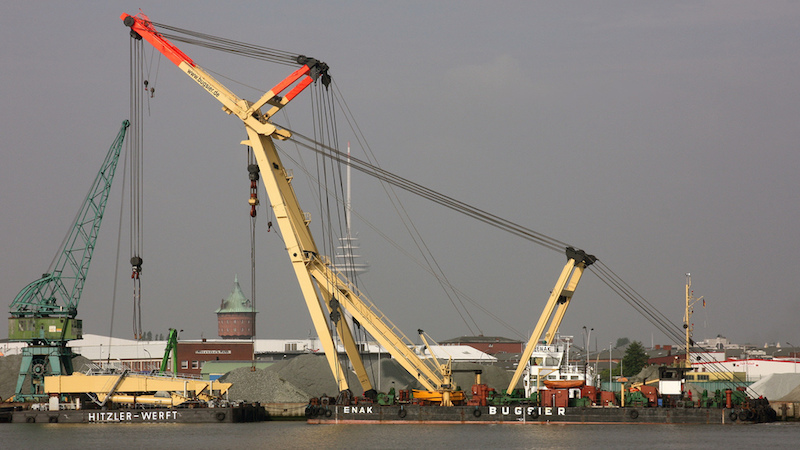 In Hamburg the two floating cranes HHLA III (100 tons) and HHLA IV (200 tons), which can lift up to 300 tons when working in tandem, are also available. The ‘Enak’ with its capacity of up to 600 tons now represents an even more powerful option. The new arrival has already been a frequent guest in Hamburg when especially heavy cargoes had to be loaded. Yet its former base at Bremerhaven involved great effort in bringing the giant to the Elbe, so that again and again cargo has been routed past Hamburg and via other ports. “Stationing ‘Enak’ in Hamburg gives shippers, project forwarders and heavy-lift shipping companies fresh opportunities to exploit the Port of Hamburg’s strengths as a project shipment transhipment hub,” said Axel Mattern, Joint CEO of Port of Hamburg Marketing. Technology giant Siemens is one example. When power supply equipment needs to be loaded, Hamburg with its specialized cargo-handling facilities is the most important port in the North Range for the group. Gas turbines from Berlin and transformers from Nuremberg are two examples. Such large transformers have a unit weight of 550 tons. It was impossible to shift them here with Hamburg’s crane capacities as they stood. ‘Enak’ now provides an option for shipping such mammoth transformers and other ultra-heavy cargoes via Hamburg. Built in 1967, technically upgraded in 1993 and now classified by DNV GL, the crane is 55 metres long and 25 metres wide. It operates under the German flag and in Hamburg occupies a berth in Ellerholz docks. Recently this powerpack was deployed on a spectacular rescue: After a pedestrian bridge to the musical theatre showing ‘The Lion King’ collapsed into the River Elbe in March, ‘Enak’ raised it and spirited it away for repairs. The world’s top trade fair for project shipment and general cargoes will be held in Bremen between 29 and 31 May. As an universal port and Germany’s largest seaport, Hamburg will naturally be showcasing with its own stand. In hall 5, on stand 1109 ten companies from Hamburg and the Metropolitan Region will be displaying their portfolio of project logistics: Port/terminal operators HHLA Hamburger Hafen und Logistik AG, Seehafen Kiel, Lübecker Hafen-Gesellschaft and Brunsbüttel Ports; shipping companies Hamburg Süd and ONE Ocean Network Express; and transport/logistics service providers Alfons Köster, SACO Shipping, TCO Transcargo and Breeze Group.